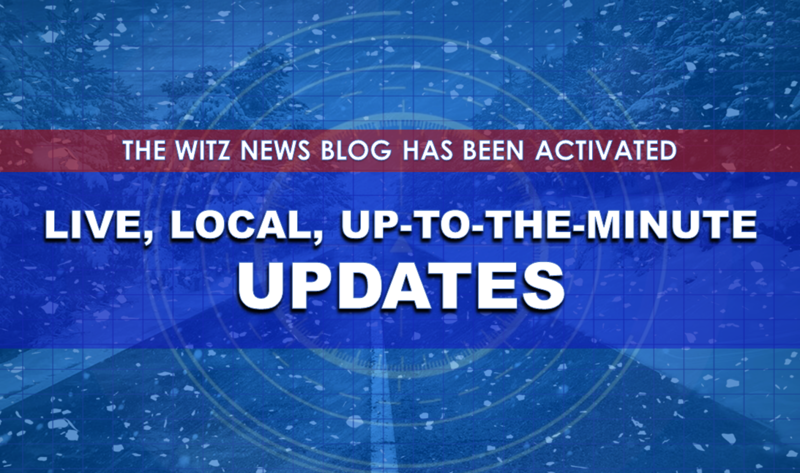 WITZ Radio News Director / Forecaster David Shepherd has activated our LIVE NEWS BLOG. Check back through the event for the latest information on warnings, road conditions, power outages, cancellations / closings and more emergency information. [5:05 a.m. SUN] U.S. 231 from Walmart to the courthouse in Jasper is icy. Plows have been through, however, the ice is packed down on the roadway so it's still very slow going. From the courthouse to Huntingburg, U.S. 231 is a solid sheet of packed down snow and ice. It's not impassable, however, you need to really slow down out there. A TRAVEL WATCH remains in effect for Orange, Lawrence, Daviess and Pike Counties. 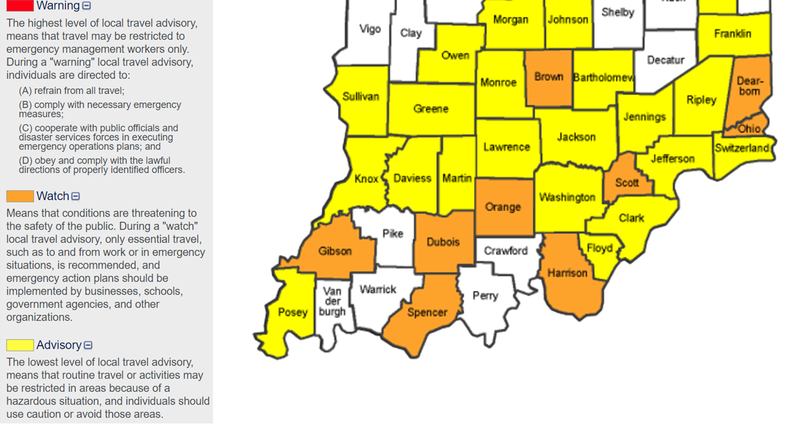 A TRAVEL ADVISORY remains in effect for Dubois, Crawford and Warrick Counties. Roads will remain slick this morning, and some roads may remain snow covered. Temperatures continue to drop, and wind chill readings through the mid to late morning hours will be in the single digits. Temperatures won't improve much this afternoon, though winds will gradually diminish. Bundle up, and take it slow on slick roads. We are currently experiencing White-Out conditions in the county with multiple accidents and slide-offs reported on Highways 50, 231 and 450, as well county roads. We are suggesting motorists stay off the roadways at this time unless it is an emergency. [7:20 p.m.] A number of slide-offs are being reported all over the county. Stay home if you can. DO NOT call 911 for road conditions. Call 1(800) 261 - 7623. [6:22 p.m.] Daviess County Sheriff’s Office and Washington Police Department reporting accidents starting. Roads conditions are deteriorating. [6:14 p.m.] Conditions will start going down hill starting now and going into tonight. If you must travel, the NWS says keep an extra flashlight, food and water in your vehicle in case of an emergency. [5:42 p.m.] Tom Vogler reports heavy sleet in Ireland. Other followers report sleet in Loogootee. The transition will happen fast now. Be prepared! [4:30 p.m.] From Dubois County EMA......Please do not call the Dispatch Centers to check on road conditions. Call 1-800-261-7623 Thank you!! [1:07 p.m.] From INDOT..... Drivers often aren’t prepared for winter driving - especially since this is the first major snow so far this winter- and forget to take it slow. The first snow events of the season typically bring higher rates of crashes and slide-offs as motorists get re-accustomed to driving in winter weather. Reduce speeds. Remember, "ice and snow, take it slow." - Nobody should be driving summer interstate speeds in winter weather. - Plan plenty of time to reach your destination safely and be patient. - Don't put yourself and others in a dangerous situation by being in a rush.Keep a safe distance. - Make sure your vehicle is following at a safe distance to stop. Do not tailgate, especially around snow plows, and try not to pass. - Give snowplows room to work, and "don't crowd the plow. "Pay attention. Avoid all distractions and focus only on the task of driving safely. - Be aware of your surroundings, drive defensively and be alert for others who are not driving safely. [11:50 A.M.] All local games set to air tonight have been postponed. No word yet on make-up dates yet. [10:04 A.M.] Indiana State Police Captain Dave Bursten reminds to you to exercise caution as you travel today and that even if you have four-wheel drive you are still just as likely to slide of the road as a vehicle with two-wheel drive. .Meteorologist Jason Puma expects most of the rain/snow mix from this morning to change over to snow once an area of low pressure pushes past Indiana through Kentucky. This will bring colder temperatures by Sunday with wind chills expected to hit the single digits. If you are traveling today, Puma says this will result in some ice to build up on roadways in areas to the north of the I-70 corridor. [7:25 A.M.] Here is the latest snow map from the National Weather Service. It puts most of our area in the 4-6+ inch range for snow. [6:30 A.M.] INDOT will have about 100 drivers reporting at about 4 p.m. local time in each sub district. Crews will be at full callout until late in the evening and overnight hours and then reduced as needed. Winds are expected to reach 30+ miles per hour. This could cause road temperatures to drop more rapidly. It also creates concerns about drifting, or snow blowing into the roadway and creating slick spots. Crews will be on the look out for this as well. Before deciding to drive, check road and traffic conditions at http://indot.carsprogram.org, 800-261-ROAD (7623) or our INDOT mobile app. County governments post color-coded travel advisories on the Homeland Security website at http://in.gov/dhs/traveladvisory. For regular updates, find links to INDOT’s Facebook and Twitter pages at http://bit.ly/INDOTsocial. [5:00 A.M.] A WINTER STORM WARNING in effect for the entire WITZ listening area, including Dubois, Martin, Orange, Crawford, Perry, Pike, Daviess, Warrick and Spencer Counties. * WHEN...From 4 PM EST /3 PM CST/ this afternoon to 7 AM EST /6 AM CST/ Sunday.. If you must travel, keep an extra flashlight, food and water in your vehicle in case of an emergency.